Christians are living in the last days before the terrible time that God pours out his wrath on earth. God will cause many natural disasters and also allow Satan to use a world leader known as the Antichrist to kill millions and to severely oppress Israel. The Church should be warning Israel and the world about the coming Tribulation. The Tribulation is a seven year period that God has determined for Israel’s chastening (Dan 9:24). During this time God will also judge the other nations on earth. Jerusalem will suffer the worst during the second half of the Tribulation. The second half of the Tribulation is called Jerusalem’s Great Tribulation (Matthew 24:21). The verse below indicates that believers in Jesus Christ will escape God’s wrath that is coming upon the earth during the Tribulation period. Does that mean that Christians will be taken out of the world before the seven year Tribulation begins? Paul the Apostle says that the worst part of the day of God’s wrath (at least for Israel) won’t come until the Antichrist sits in the newly built temple in Jerusalem acting like he is God. I think that this event happens in the middle of the seven years long Tribulation period. So perhaps Christians will see the first half of the Tribulation but I tend to think that they won’t. The first half of the Tribulation is full of terrible wars and natural disasters especially for the old world nations. Israel will make a pact with world powers for their security and they will also give up their land to their enemies. This peace treaty is considered to mark the beginning of the seven years long Tribulation period. The Antichrist will participate in this treaty. The Antichrist is a world leader who will eventually become the sole ruler of the next World Empire. I think that Turkish Prime Minister Erdogan is the most likely candidate to fulfill the role of the Antichrist. During the seven years long Tribulation period Israel will be oppressed and nearly eradicated by the next World Empire. The next World Empire could be formed before or during the seven year Tribulation period. Daniel chapter 7 describes the European Union, the new Russian Union, and a new Islamic Union as they combine to form the next World Empire. During the first half of the seven years long Tribulation period the Antichrist will invade and conquer Egypt. He will continue on from Egypt to attack Jerusalem. Please read my commentary titled “Egypt will not escape”. Psalm 83 describes Jewish refugees from around Jerusalem that have fled to Jordan. Near the end of the Tribulation period the nation of Jordan will bring Lebanon, and northern Iraq together to wipe out the Israeli refugees in Jordan. Jesus will wipe out these armies when he returns to earth. Jesus will visit Jordan just before he enters Jerusalem (Zec 12:7) . Read my commentary titled “Revelation Wrath Path“. Just before Jesus second coming a city called Mystery Babylon will be destroyed by Iran and the Kurds. It is a wealthy seaport city in the desert. Mystery Babylon rebels against the God of Israel and supports terrorist organizations. It is a city of slavery, prostitution, and world dominance. I think that city may be Dubai but a strong case could also be made for Mecca. Read my commentary titled “Dubai a case for Mystery Babylon“. Seal judgments: There is a scroll in heaven that only Jesus can unroll. This scroll has 7 seals keeping it rolled up. This scroll is unrolled one seal at a time. Each time a seal is broken a new judgment of God is announced (Rev 6-8). These judgments don’t fall in particular on Israel. Instead they fall on the other nations of the world. What nations will receive the worst punishment? I expect that the old world nations between Europe and India and from Russia to Saudi Arabia will be hit the hardest. These are the original nations of the world. These are the same nations that formed every past World Empire. These are the same nations that will form the next World Empire. These are the same nations that will oppress Israel during the Tribulation. Seal 1) A rider with a bow sitting on a white horse, sent forth to conquer. Who will conquer who? The Antichrist will conquer Egypt and much of northern Africa during the first half of the Tribulation. I think that he will also conquer Syria perhaps before the Tribulation begins. Also Russia will conquer several nations. This is all part of creating the next World Empire. Of course there could be much more indicated here. Seal 2) A rider with a sword sitting on a red horse, taking peace away from the earth that people should slaughter one another. This seems like it could already be happening in northern Africa, the Middle East, and Central Asia. In almost every nation people are slaughtering their own countrymen. Seal 3) A rider with balances sitting on a black horse. I think that this rider is sent to destroy crops and food sources. He is instructed to protect the price of wheat, barley, olive oil, and wine. Seal 4) Death is riding on a pale (or green) horse, killing 1/4 of the earth’s population with hunger, and death, and wild animals. Seal 5) We see the souls of believers that have been killed during the Tribulation but not yet resurrected. Seal 6) The opening of the sixth seal is the sign of the coming of the worst part of God’s judgment on earth with an earthquake, darkened sun, red moon, and stars that fall to earth. Seal 7) The opening of the seventh seal announces even worse judgments. Before it is opened God protects 144,000 Jews so they will not be harmed. After it is opened there is a dramatic pause in heaven. The opening of the seventh seal reveals seven angels blowing seven trumpets. Each angel blows his trumpet one at a time. Each trumpet announces a terrible event on earth. Trumpet 1) Hail and fire burns 1/3 of trees and all green grass. Trumpet 2) A burning mountain is cast into the sea turning 1/3 of the sea into blood. Trumpet 3) A burning star falls onto the rivers turning 1/3 of the rivers bitter. Trumpet 4) 1/3 of the sun, moon, and stars are darkened. Trumpet 5) Demonic locusts torment men for five months! Trumpet 6) A 200,000,000 soldier army from the Euphrates River kills 1/3 of people. This could be a Sunni-Shia Muslim war. The vast majority of Shia Muslims live along the Euphrates in Iraq and Iran. The Shia population as of 2009 is estimated to be 200 million. I expect Turkey and Iran to lead these wars. I think that Muslim Brotherhood groups will devastate nations that are not following the Muslim Brotherhood. Trumpet 7) The seventh trumpet is blown and we are introduced to seven vials. Each of the seven angels pours out his vial one at a time and seven terrible events happen on earth. 1) People are struck with sores. 2 & 3) Their water supply is turned into blood. 4) The sun scorches men with fire. 5) The World Empire is struck with darkness. 6) The Euphrates River is dried up allowing a large army to cross over toward Israel. 7) The seventh vial completes God’s judgment on earth. It includes Jesus Christ’s return to earth to defeat Israel’s enemies along with the battle of Armageddon and also the destruction of the city called Mystery Babylon. Keep up the good work as a watchman. In Rev 6:9-11 we are not seeing bodies but we are seeing the souls of believers that have been killed. But we are told that more believers must still be killed. People will be saved during the tribulation. If this was the entire Church they would not be described as souls that have been slain. The Church consists of all believers from the time of Christ to the present. Most Christians have not been killed for their faith. Rev 6:9-11 And when he had opened the fifth seal, I saw under the altar the souls of them that were slain for the word of God, and for the testimony which they held: 10 And they cried with a loud voice, saying, How long, O Lord, holy and true, dost thou not judge and avenge our blood on them that dwell on the earth? 11 And white robes were given unto every one of them; and it was said unto them, that they should rest yet for a little season, until their fellowservants also and their brethren, that should be killed as they were, should be fulfilled. 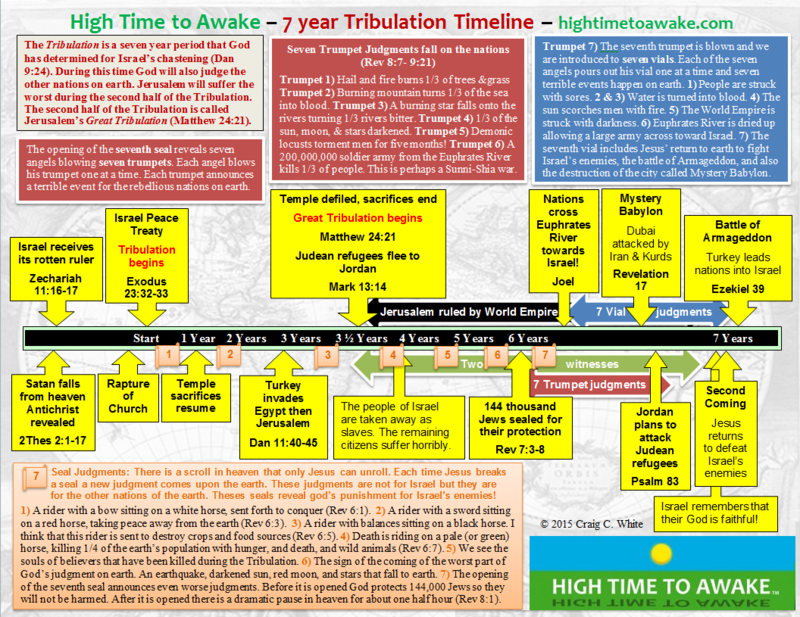 We are told that all great tribulation martyrs are assembled in Rev 7:9-14. Whether in body or soul I am not certain. They seem to be in body because they are handling palms and they are no longer described as souls under the alter. That may mean that there is a resurrection and rapture of tribulation believers near the end of the tribulation. Rev 7:9-14 After this I beheld, and, lo, a great multitude, which no man could number, of all nations, and kindreds, and people, and tongues, stood before the throne, and before the Lamb, clothed with white robes, and palms in their hands; 10 And cried with a loud voice, saying, Salvation to our God which sitteth upon the throne, and unto the Lamb. 11 And all the angels stood round about the throne, and about the elders and the four beasts, and fell before the throne on their faces, and worshipped God, 12 Saying, Amen: Blessing, and glory, and wisdom, and thanksgiving, and honour, and power, and might, be unto our God for ever and ever. Amen. 13 And one of the elders answered, saying unto me, What are these which are arrayed in white robes? and whence came they? 14 And I said unto him, Sir, thou knowest. And he said to me, These are they which came out of great tribulation, and have washed their robes, and made them white in the blood of the Lamb. The Harlot rides the Beast (Islamic Confederacy of Nations), Mecca must be this Harlot. Mecca is to Islam as Rome is to Catholicism. Hi Mike. Mystery Babylon is a city that is destroyed just before Jesus Christ’s second coming. It is the mother of false religion. the name Mecca means mother. I think that Mecca is Mystery Babylon. I wrote a commentary titled “Dubai; a case for Mystery Babylon”. Dubai and Mecca share many of the same characteristics.